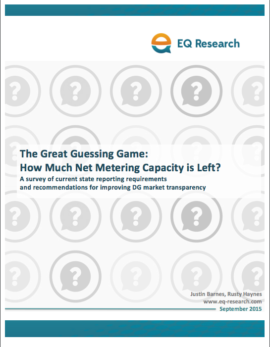 The Great Guessing Game: How Much Net Metering Capacity is Left? Weak reporting requirements for net metering in some U.S. states are needlessly creating murky market conditions for distributed solar PV and other renewables. This study describes net metering reporting requirements and practices in 13 U.S. states, and offers nine recommendations for improving such requirements and practices. Net metering, a long-time foundational element of distributed solar economics, is available in 44 states and the District of Columbia. Opportunities and conditions in the distributed solar market largely depend on a state’s policy framework, and a state’s policy framework and market conditions can change quickly. When a utility nears or reaches its aggregate net metering cap, the market for new distributed solar in that utility’s service territory can come to an abrupt halt. Therefore, understanding the future availability of net metering in a state is critical to project planning, investment, and decision-making for solar developers, customers, and policymakers. Net metering reporting requirements and practices vary widely among U.S. states. The data provided by these reports can offer useful insight to policymakers, regulators, developers, consumers, investors, researchers, reporters and others. However, the usefulness of net metering reports depends on the types of data included, how frequently the data is reported, and in what format the data is provided. The Great Guessing Game: How Much Net Metering Capacity is Left? examines and compares reporting requirements and practices in 13 states with different levels of distributed PV market maturity: California, Delaware, Illinois, Kansas, Louisiana, Maryland, Massachusetts, Minnesota, New Jersey, New York, North Carolina, Utah and Virginia. Based on the findings of this study, the authors proposed nine ideal data and reporting practices for states and utilities to consider. These proposed ideal practices are especially important in states with large or burgeoning distributed solar markets. The full study and its recommendations — available for free — may be downloaded using the form to the left. An interactive map of all states’ net metering caps is available here, and an interactive map of state progress toward these caps is available here.